I have been saving up this ‘So Healthy You Won’t Believe It’ Vegan Oreo Cookies recipe for a special occasion and now with Valentine’s Day approaching, it seems like the perfect occasion to post this recipe. Here’s the background. One day I had some left over soy cream frosting remaining, and suddenly thought they would be perfect in Oreo-like cookies. I wondered if it might be possible to make a healthy, low-sugar, nutrient dense, plant-based version of Oreo tasting cookies and began immediately to work on this idea. Inspired by the Healthy Oreos recipe from @chocolatecoveredkatie, I experimented with some modifications and ended up with a low-sugar, plant-based, dairy-free, egg-free, nut-free and potentially gluten-free version that our whole family loves. It turned out so delicious that our family ate up the whole batch of these ‘Oreo’ cookies in one sitting and I barely had time to take pictures! I think we found the combination of slightly bitter cocoa-y cookies with a sweet creamy filling inside irresistible. What makes these ‘So Healthy You Won’t Believe It’ Vegan Oreo Cookies truly unique is that the whole batch of cookie rounds only uses 2 tablespoons of maple syrup, and no other kinds of sugar or sugar substitutes. 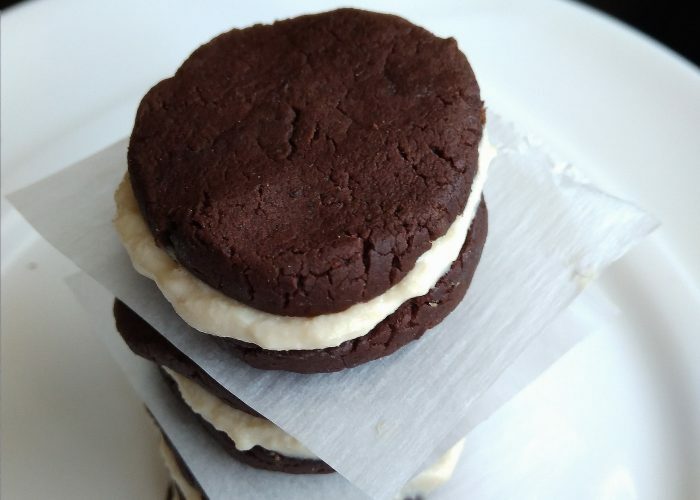 The recipe for the white creamy filling calls for using another 2 tablespoons of maple syrup but you will likely only use half the amount of soy cream filling for one batch of sandwich cookie rounds. Not only that, this simple recipe consists of mainly whole-food, plant-based ingredients that are either already available in your kitchen or can be readily and inexpensively purchased at the grocery store. Read the recipe below consisting of just 10 ingredients for the cookie rounds and see what you think. The longest time really is refrigerating the dough as the baking time is only 10 minutes. But you can use this time well by making the protein-rich soy cream filling. Don’t have dates or don’t want to use them? Just substitute the 1/3 cup of dates in this recipe with ½ cup of raisins (see Recipe Notes). These ‘So Healthy You Won’t Believe It’ Vegan Oreo Cookies can also be made gluten-free by using oat flour (made from certified gluten-free oats) or a gluten-free specialty flour mix. This is one batch of cookies you can make that your whole family will be delighted to have as an after school snack, a pack-able treat in school and work lunch boxes, for a post-dinner light dessert or to just enjoy as an evening snack. If you choose, you can even make these cookies rounds into heart shapes for Valentine’s Day! A vegan, plant-based, dairy-free, egg-free, nut-free, low refined sugar and possibly gluten-free version (if certified gluten-free oat flour is used) that your whole family will love for Valentine’s Day, as a post-meal treat, snack or pack-able item in school and work lunch boxes! Soak the 1/3 cup of pitted dates in a cup of ‘just boiled’ hot water for 10 minutes. (Alternatively, soak ½ cup of raisins in hot water for 5 – 10 minutes until plump, then drain the water). While the dates (or raisins) are soaking, combine the dry ingredients (sifted flour, cocoa powder, salt and baking soda) into a large bowl and mix together. Then set the bowl aside. After 10 minutes, remove the soaked pitted dates and place them in a food processor (if using raisins, place the plump soaked raisins in the food processor). Add the vegan margarine, vanilla extract, coconut oil and maple syrup. Do not add the plant-based milk yet. Pulse a few times, stopping to scrap down the sides of the food processor bowl, until a smooth puree is obtained. Place the food processor contents into the bowl containing the dry mixture and stir until well combined and a dough is formed. Add 1-2 tablespoons of the fortified plant-based milk if the combined mixture is too dry to form into a dough. Refrigerate this dough for 30 minutes. During this time, make the soy cream filling if you haven’t already done so (read here for instructions) and keep it in the refrigerator until it is ready to be used (ingredients for the soy cream filling are listed above). About 10 minutes before the end of the refrigeration time for the dough, preheat the oven to 300 F or 150 C, and line a baking tray with parchment or wax paper. After the 30 minutes is up, remove the dough from the fridge and place it into a plastic bag (I used a gallon sized plastic zip bag). Then using your hands, squish the dough into a big compact ball, before lengthening it into a very compact long log-like roll (about 1.5 inches in diameter). Place this log-like roll onto a cutting board and carefully slice it into thin cookie rounds using a thin serrated knife. Place each round onto the parchment paper lined cookie tray and gently press each piece down a bit with your fingers or the back of a spoon. Bake the cookie rounds in the oven for 10 minutes. Then remove the baking tray from the oven and let the cookies cool on the baking tray for 10 minutes before removing them from the tray. The cookies will harden nicely as they cool down. Before serving, spread a teaspoon of the soy cream filling on half the baked cookie rounds, and then top with the remaining baked rounds to form cookie sandwiches. Store leftover soy cream filling and cookie rounds in the refrigerator. Only add the fortified plant-based milk if the batter is too dry to form into a cookie dough. Our family thought the cookies were sweet enough, but if you would like a little bit more sweetness, then add another tablespoon of maple syrup (or honey or agave nectar) into the food processor bowl when pulsing. If you don’t have coconut oil, you can substitute with vegetable oil instead. Since the soy cream filling can be made in advance, you can make the cream filling the day before. Then on the day itself, you can simply bake the cookie rounds before smearing on the filling to assemble into sandwich cookies. Since this recipe makes only 13 sandwich cookies, you might want to double the recipe at the onset to make more if it is for a party function. Once formed together, store the sandwich cookies in the fridge to prevent food safety issues given the creamy soy frosting. The baked cookie rounds could also be made up to a day or two in advance and stored in an airtight container at room temperature. So if you prefer, you could make both beforehand and just assemble on the day of serving! Although the ‘Oreo’ cookie rounds themselves can be frozen, the soy cream filling itself cannot as the texture would be negatively affected. So if you would like to make extras and freeze them, simply just freeze the cookie rounds, then take them out to thaw, and spread on freshly made soy cream filling on the day of serving. But I seriously doubt you will be able to have a batch of cookies last that long in your home once you’ve made them!